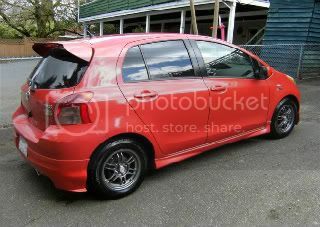 This is my 2008 ride from Panama, and I have done some minor modifications, that some are from YARISWORLD, but others you might like, the rims are 16x7, nothing fanzy, but I like the polish lip, and quite lite, running on Ventus 205/45/16, no rubbing probem since its not lower, and will keep it this way, roads in my country are not that nice. For those that have a growing family like me and still want to keep the trunk space, my subwoofer box migthbe of your interest, these are two 8", 200 watts rms/800 peak on a seal box, and I have a small amp under the passanger seat, but at 70+70 rms for each one, makes the rear view mirror dance. It took me a while to select a speaker, since you can also use shallows, the only problem that must of them are 10" +, and need much power, but you can go with Pioneer, Sony, Clarion, just to mention some, I selected JBL for good sound, 0.3 cu. ft. seal enclousure, and a good price, and I also made the rods with stailess stell, and not to mention, that insted of loosing space I gain som extra with the hatch door for some extra cargo space. My rear speakers are 6x9, 4 ways Pioneer, don´t let the small grill fool you, I made the other one to let some air from the trunk to pass to the cabin, works fine. i just install the new leather costum fit boot, with my old aluminum knob, and it ended up looking better that I spected. I will show some more later, I hope you like this. Very clean and nicely done! Love the seat covers. i like the sub setup. The sub is sweet !! thank you, with the subs, I had a vented enclousure before, but not only was taking space, but was also running around in every curve, so by doing this I did solve that problem and even got some extra space. hey your car doesnt look like an AMC...haha just messin (i did read the initials part) nice car, love the audio setup! the amc thing, my, and my wife (had to include her, she was the one who did the job) initials, so it´s like personal family logo!! I need my SOUNDS upgraded now!!!!! Nice stuff.........luv the embroidery...good job over all. I also made the pioneer HU fit in this place, and since it got usb input, I put it on the side pocket, with the auxiliar cable and other audio cables that I could use,even if want to use the cell phone. I looked for a stailess tip for the muffler and found this one, that like every thing else i cut and modify to fit to an angle that match the actual tip, and it looks great.